A couple more flowers |Sundews Etc. I feel like all I've been posting about lately has been flowers, but I guess that's okay. First off, my Utricularia sandersonii blue form has fully matured and is a full-on angry bunny. Look at that little bunny glaring at you. 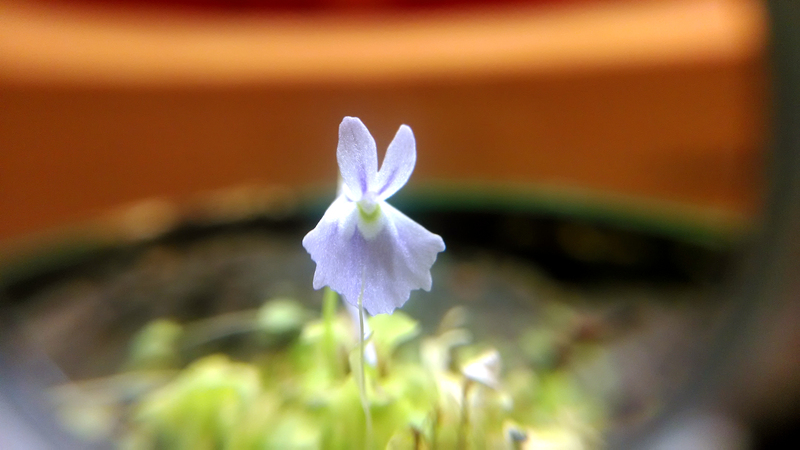 Such an elaborate little flower on this Utric. The spur is even better now. 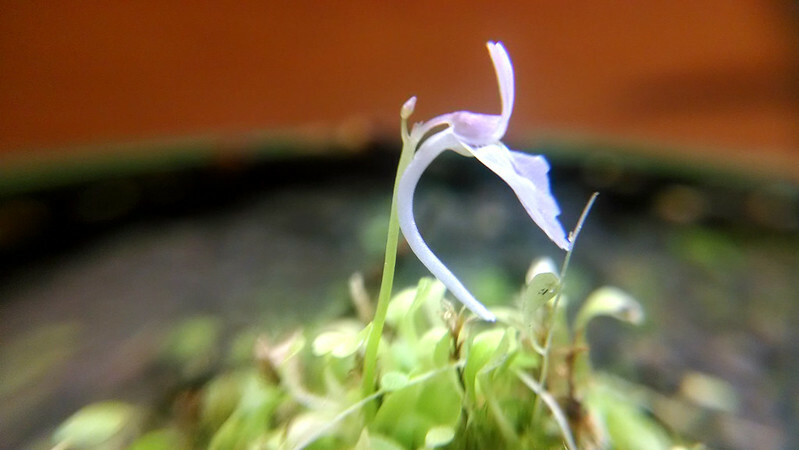 The Utricularia livida next door is also just getting started with its show, which promises to make for a cheery couple weeks under the lights. Those flower scapes are really silly. 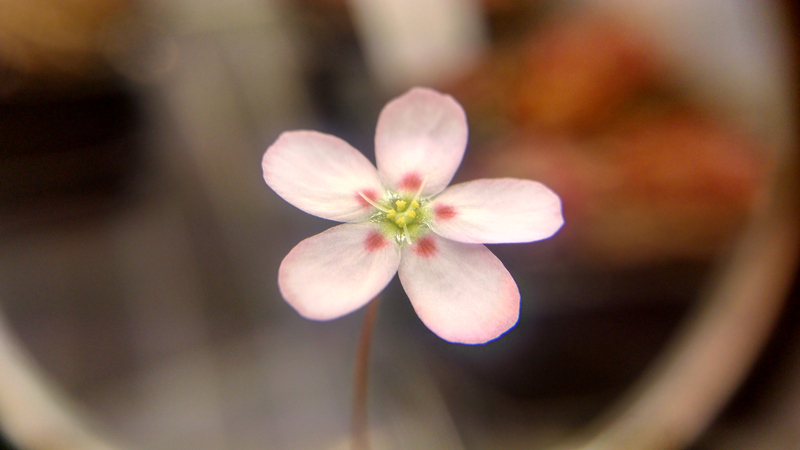 Also, excitement of excitements, the Drosera helodes I only recently received from Brie popped its flower open today, and it is lovely. I was so delighted when I wandered over to the tray today. My roommate was quite taken with the little dots, as am I. 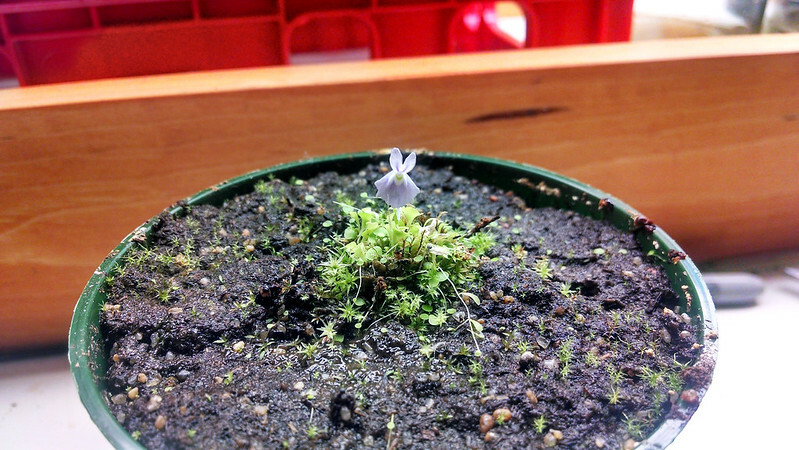 Those little dots are just the sweetest thing, and the plant looks so proud of its little bloom. I also noticed the first flower stalk on my Drosera burmannii. Surprisingly, the first one to bloom is by no means the largest. 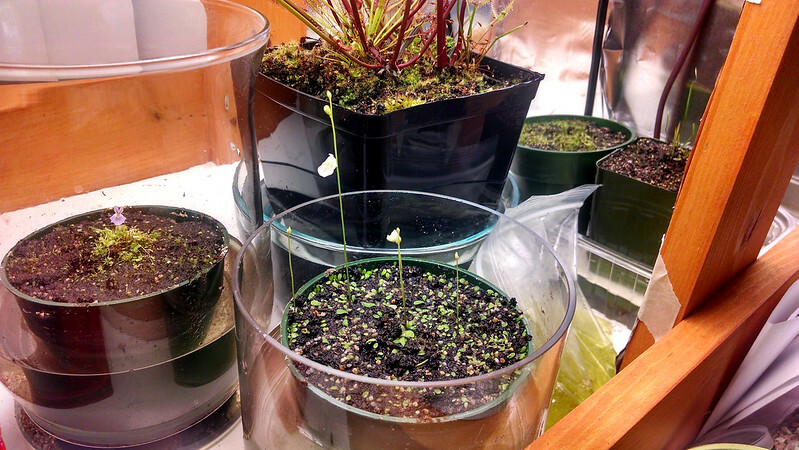 This is quite exciting, as I can sow D. burmannii along with my others once I get my propagation area started. 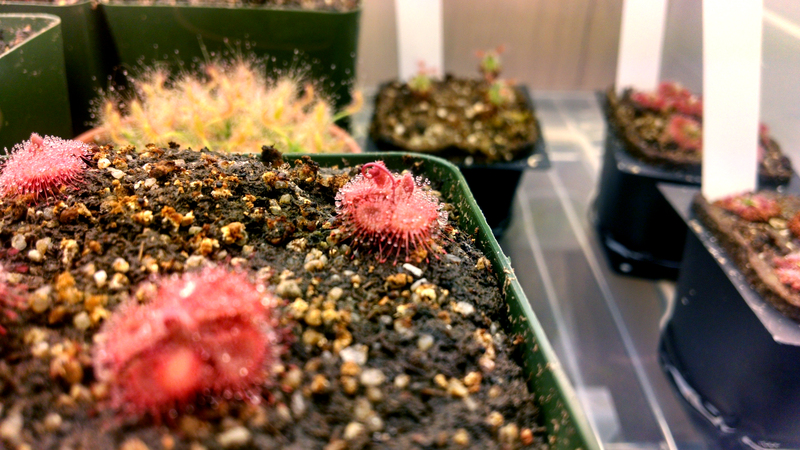 This sundew should be in everyone's collection! 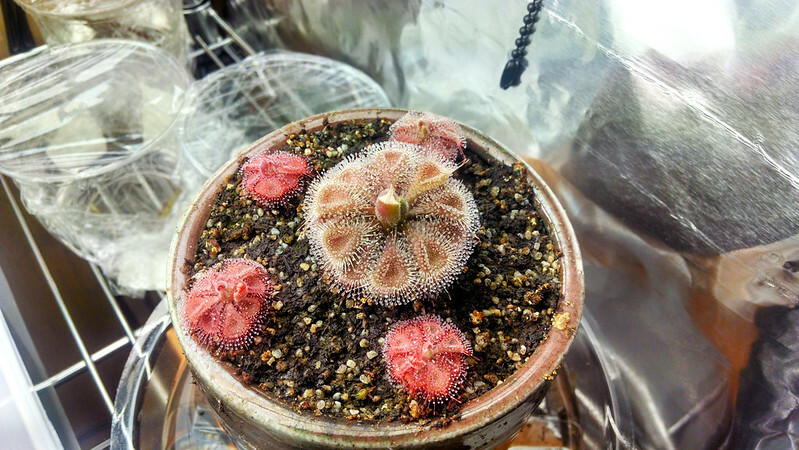 Interestingly, my largest specimen has lost a great deal of its striking red color. I'm not sure exactly why – it still looks fantastic, but I really do wish it was still that brilliant red. I'm going to move it very close to the lights soon, to see if really high light intensity (and somewhat higher temperatures) can stress it nicely. Still looks great though. I bet this plant could eat a June bug if one happened by. Wow! Those look great! Really like the pygmy flowers! I know, they're so showy! 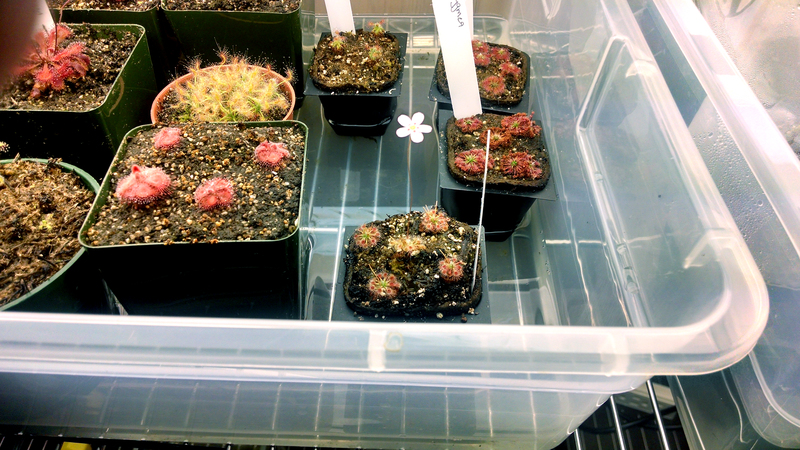 There's a flower stalk coming up on one of the D. pygmaea too, I'm excited.